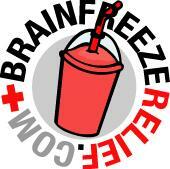 So to offer tips on how to cure brain freeze - and promote a new line of drinks called Krystal Freeze - the MySpace page was born. It explains the ailment, what causes it and what you can do to stop it, all while promoting a drink that causes the problem in the first place. Hmm. Thank God juice drink marketers aren't held to the "high standards" DTC marketers are. If they were, we'd have no MySpace pages like Brain Freeze Relief to play with and friend.